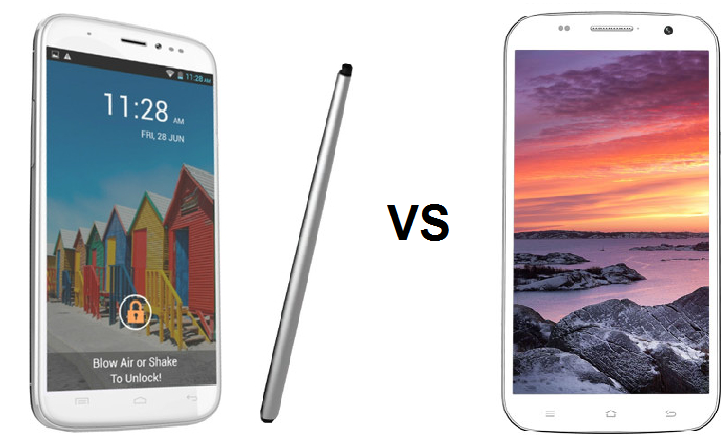 The second iteration of the Doodle (Quick Review) from Micromax’s Canvas series seems to have found itself in a tussle. The device is getting a new competitor every now and then, and after comparing it to the Samsung Galaxy Mega 5.8, we’re back with another comparison review, this time against a Chinese counterpart, the Zopo ZP990. The ZP990 comes with a slightly larger 6” display as opposed to the 5.7 inch on the Doodle 2, and at the same time, packs a better (Full HD) resolution too. Let us go ahead and explore other facets of these two phablets. As just mentioned, the Doodle 2 comes with a 5.7 inch screen while the ZP990 does a 6 inch. Given the large size of the devices, the difference in screen size shouldn’t really be a deciding factor, sice 0.3 inches on devices with 5.5+inches hardly makes any difference. However, something that will definitely make a difference is the display resolution. The Doodle 2 comes with a slightly outdated (in pure relative terms) 720p resolution, while the ZP990 packs a full HD resolution on it’s 6 inch panel. This means that multimedia and gaming would be far more enjoyable on the ZP990 as compared to the Doodle 2, solely for the fact that a full HD resolution results in a much better pixel density. We really believe that a full HD resolution is not really needed (and does not help) on devices with screens smaller than, say, 5.5 inches. We really like the idea of a full HD display on a 6 inch panel, as adopted by the Zopo ZP990. The ZP990 beats the Doodle 2 as far as the processing capabilities are concerned. The ZP990 comes with the updated MT6589T which has 4 cores running at 1.5 GHz while the Doodle 2 adopts the older MT6589 chip which comes with 1.2 GHz per core on all 4 cores. More info on this difference between the MT6589 and the MT6589T can be found here. Both these devices, like most other budget and non-budget devices of today, come with decent imaging hardware. The Doodle 2 packs a 12MP rear camera and a 5MP front, while the ZP990 comes with a similar 5MP front camera, but does a bit better on the rear with a 13MP unit. The picture quality on these sensors should more or less be the same, and due to the extra number of pixels on the ZP990’s camera, you might feel like the images from this one are better. As far as the front cameras are concerned, since both come with a 5MP unit there’s nothing much to compare. A 5MP unit should more than suffice for an average user. Video call quality is expected to be above average, and at the same time, people who like to take self-portraits might like what they get out of these devices. The Doodle 2 comes in a single variant that packs 16GB of ROM along with 1GB of RAM, which does make for a formidable setup. On the other hand, the ZP990, keeping up with Zopo traditions, comes in 2 variants; one being the 1GB RAM 16GB ROM variant, while the other being 2GB RAM coupled with 32GB ROM. The 2GB ROM variant should quite easily beat the Doodle 2 on most aspects of the device. The ZP990 again beats the Doodle 2 with it’s 3000mAh unit against the 2600mAh on the Doodle 2. However, given the larger screen size and the extra number of pixels on the ZP990 (there are more than double the number of pixels on a 1080p screen as compared to a 720p screen), it will be interesting to know by how much the ZP990 beats the Doodle 2 in terms of battery life, if at all. Many Android devices don’t really live up to the expectations when we’re talking about the battery life. However, with these 2 devices, 1 full day of battery backup (4-5 hours of screen on time) can be expected. The rest will be known only once the devices get released to the public. The ZP990 is indeed a very impressive device from Zopo. The Doodle 2 does seem weak in front of the this device, and being priced higher, the Doodle 2 might have a tough time. The 2GB RAM edition of the ZP990 blows the competition, while even the 1GB RAM edition looks like the stronger one out of the two when compared to the Doodle 2. The decision is yours; you can either go for a Chinese brand and get a better screen, CPU, etc., or you can go for the Doodle 2 which promises a better after-sales support when compared to the ZP990.